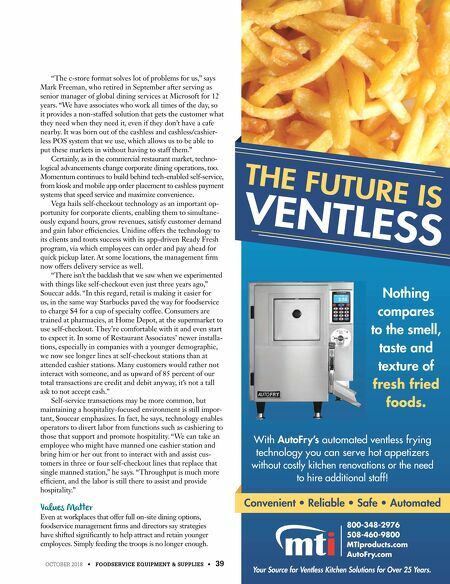 OCTOBER 2018 • FOODSERVICE EQUIPMENT & SUPPLIES • 39 "The c-store format solves lot of problems for us," says Mark Freeman, who retired in September after serving as senior manager of global dining services at Microsoft for 12 years. "We have associates who work all times of the day, so it provides a non-staffed solution that gets the customer what they need when they need it, even if they don't have a cafe nearby. It was born out of the cashless and cashless/cashier- less POS system that we use, which allows us to be able to put these markets in without having to staff them." Certainly, as in the commercial restaurant market, techno- logical advancements change corporate dining operations, too. Momentum continues to build behind tech-enabled self-service, from kiosk and mobile app order placement to cashless payment systems that speed service and maximize convenience. Vega hails self-checkout technology as an important op- portunity for corporate clients, enabling them to simultane- ously expand hours, grow revenues, satisfy customer demand and gain labor efficiencies. Unidine offers the technology to its clients and touts success with its app-driven Ready Fresh program, via which employees can order and pay ahead for quick pickup later. At some locations, the management firm now offers delivery service as well. "There isn't the backlash that we saw when we experimented with things like self-checkout even just three years ago," Souccar adds. 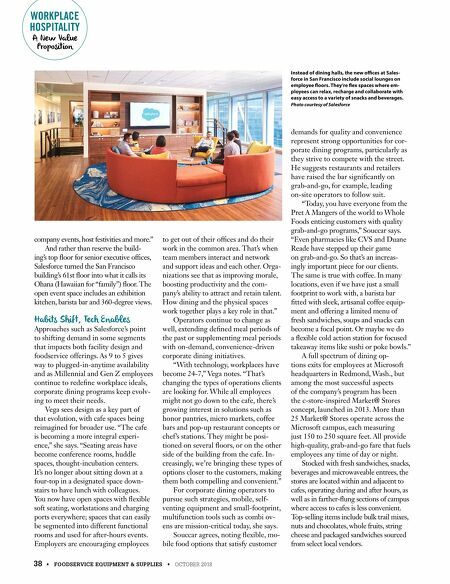 "In this regard, retail is making it easier for us, in the same way Starbucks paved the way for foodservice to charge $4 for a cup of specialty coffee. Consumers are trained at pharmacies, at Home Depot, at the supermarket to use self-checkout. They're comfortable with it and even start to expect it. In some of Restaurant Associates' newer installa- tions, especially in companies with a younger demographic, we now see longer lines at self-checkout stations than at attended cashier stations. Many customers would rather not interact with someone, and as upward of 85 percent of our total transactions are credit and debit anyway, it's not a tall ask to not accept cash." Self-service transactions may be more common, but maintaining a hospitality-focused environment is still impor- tant, Souccar emphasizes. In fact, he says, technology enables operators to divert labor from functions such as cashiering to those that support and promote hospitality. "We can take an employee who might have manned one cashier station and bring him or her out front to interact with and assist cus- tomers in three or four self-checkout lines that replace that single manned station," he says. "Throughput is much more efficient, and the labor is still there to assist and provide hospitality." Values Matter Even at workplaces that offer full on-site dining options, foodservice management firms and directors say strategies have shifted significantly to help attract and retain younger employees. Simply feeding the troops is no longer enough.